When you’re a book nerd, terms like “fan fiction” aren’t as dorky as they are for the rest of the world. And of course, the King of Fan-Fic. is JK Rowling’s Harry Potter series. There are hundreds of thousands of people adding to the canon of HP-related goodness. There are “shippers” (people who root for certain characters to get together), straight fan fiction authors (who create spin off’s to JK Rowling’s stories based on the information she supplies in the books), and there are people who just like to imagine and inhabit the world Rowling’s created — whether it be via art, video games, imagination, Pottermore, or something else. But if there’s one bit of “fan fiction” I would say isn’t exclusive to book nerds, I’d have to say it’s self-sorting. Self-sorting is quite simply someone deciding which Hogwarts house they belong to based on the inherent information and personality traits they possess. 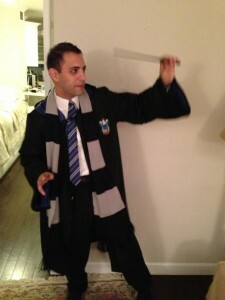 I’ll admit: my knee-jerk reaction was Gryffindor. It’s only natural. It’s where we (the readers) spend most of our time as we experience Hogwarts. We know the dorms intimately, and we are comfortable with getting in. Yet, I knew (almost as soon as I thought of myself in Gryffindor) that I didn’t belong. To be honest, I don’t consider myself particularly brave. So I began moving towards the other houses. Slytherin next. “Going Green” is a difficult decision. Once you put aside all of the villany and try to rationalize what a slytherin is at his or her core, it’s very difficult to not see oneself as possessing at least some of their traits. Yet here too, I knew I was out of place. Cunning and self-perpetuation are not my chief concerns in life. I think we should all strive to be Hufflepuffs. And indeed, they are (on the whole) intelligent, but not obnoxious. They are ambitious, but are not swayed by pride, they are loyal but not foolish. And, Rowling has also recounted that in Harry Potter and the Deathly Hallows, Hufflepuff is the only house that remains in its entirety (other than Gryffindor) to face off against Tom Riddle & Co.
Yeah…that’s great. But, it’s not me. I realized it when I was considering the houses (all of this happened in a matter of seconds). And I knew with certainty when I came to Ravenclaw, that I was silver-and-blue, through-and-through. Everything I value, the way I work, and the aspirations I have in life all center on intelligence. And I can’t tell you how many times I’ve repeated the house phrase. I may not be the smartest person in the world, or even in the room (though most times I’d disagree with that), but I certainly value the merits and benefits of intelligence above all else. Plus…Luna Lovegood is delightful (bested on page only because Evanna Lynch is stunningly gorgeous). 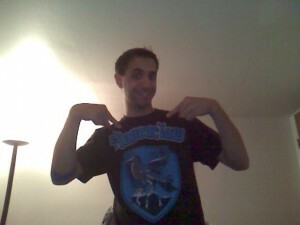 Anyway, the point is I knew I was a Ravenclaw early on. So, you can imagine that it came as no surprise to me that when I logged onto Pottermore, and honestly took the sorting quiz, that I found myself in the West Tower, overlooking the mountains and staring up at an enchanted, starlit ceiling. It was only proper. Check out some funny pictures of me. One of them is from a few years ago, before DH was released. Another was Halloween 2012, where I dressed up in Ravenclaw house robes and garnished my wand.